My former student Angelica loves typography and she loves dogs. Her own project married dog breeds to personality test results in an interactive quiz. This weekend she sent me this gem of a find: Classic Fonts. 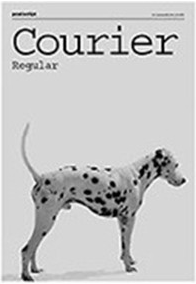 I think Courier is totally “spot” on (pun intended). I’m not crazy about Bodoni, though. I think the contrast between thick and thin could be made more evident in another breed. What say you?